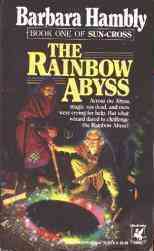 Barbara Hambly's 1991 *The Rainbow Abyss* (Locus award nominee, 1992), is a leisurely paced fantasy story centered around wizards and, ostensibly, their fascination with a "dark well" which has shown them a world in which magic no longer exists, a matter that the most senior among the involved wizards, Jaldis the blind, sees as a threat to the state of magic in their own world. "Ostensibly" is the key word, here, because most of the book is not concerned with the dark well or what secrets it reveals, because that's all just underpinning for the two-book series. No, what's at stake here is less an exploration of the fragility of magic in a world that uses it, but much more an exploration of the troubles of a young apprentice wizard, Rhion the brown, and his love for the seemingly unobtainable Tally, daughter of a high and mighty duke. Using the standard-issue pseudo-medieval setting, complete with its rigid social hierarchies, Hambly places wizards squarely at the bottom of that totem pole, a place rather much like the one occupied by the shunned harijan of east Indian culture, wherein the magic users may be harried or slain with impunity, thus clearly setting up the great divide between Rhion and Tally. It is this kind of social exploration that lets Hambly's work shine brightest, simultaneously raising at least one interesting question regarding the place of magic in the invented world. On the one hand, we see a society that shuns the practitioners of magic yet appeals to those powers to salve common human concerns, whether it be to treat physical ills or merely lovesick ones; and on the other hand, and more importantly, we see a society that doesn't really seem to need magic. Yes, it exists, and Hambly gives us many passages regarding Rhion's past and present studies of such arts, but there remains a curiously absent feeling or depiction of the necessity of magic in Rhion's world. This weakness undermines the importance placed upon the mysteries of the dark well by Rhion's master, Jaldis, who thinks that the secret to preserving magic in their own world can be discovered by finding out why it went away in another. Given that magic possesses no controlling interest in the world of Jaldis and Rhion, we're left to wonder at the real importance of it, as its preservation seems not world-saving, but self serving. Yet the social contrasts remain, and to a much greater degree overshadow such shortcomings of story. Clearly there are analogues here between Christianity's prohibitions and warnings against magic -- represented by the cult of Agon, the Veiled God, a cult which grows in power and influence throughout the story -- and the cultural displacement of lesser beliefs, whether paganistic or otherwise, and to recognize them as they play out points to inevitable conclusions that, if realized, satisfy dramatic senses of tragedy and that, if not realized, might satisfy other dramatic senses of surprise, or so-called peripeteia. Except the story ends with a final, open-ended, visit to the dark well as important wizards disappear and the Agonites make their boldest public statements against magic. A sense of tragedy is left hanging in the balance (will the cult of Agon reign supreme and throw magic down? will Tally and Rhion be separated forever? ), and a dramatic surprise is merely started, not finished. Which is why this is book one of the two-book *Sun-Cross* series, after all. If you want to know what happens, what really happens next, you'll have to read the other book, *The Magicians of Night*, wherein these questions, and more, will be answered. In short, though it may be unfair to judge a story that can be rightfully said to exist in two books, not just one, Hambly's first work in that series ultimately succeeds in getting us to want to know more about what so slowly boils in the background, doing so through the foreground events of Rhion's adventures and pursuit of Tally, yet readers will probably be left wanting more of what stays too much in the background (the dark well and the cult of Agon, for instance) and less of what occupies center stage; namely, Rhion's studies of magic.